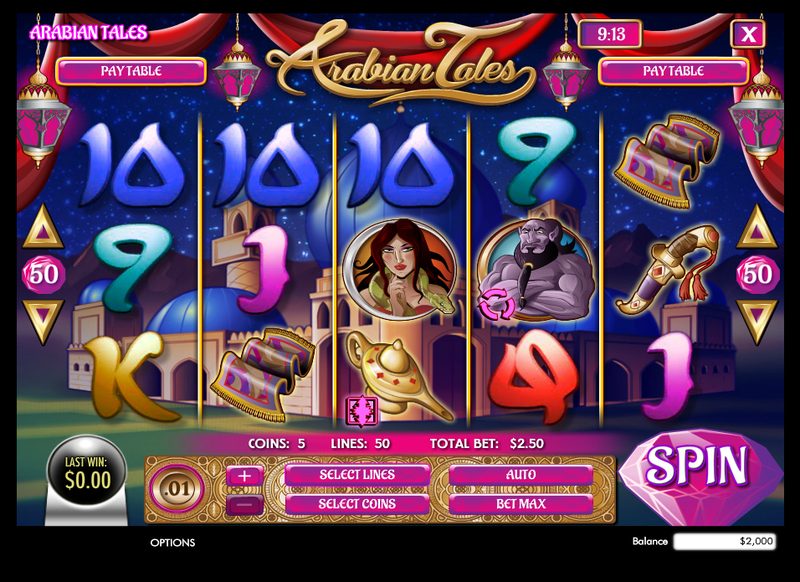 Arabian Tales slot is a 5 reel slot with 3 rows and 50 paylines. The theme is a slightly juvenile looking cartoonish take on the story of Aladdin, although their is no mention of Disney's popular little Eastern Prince. The symbols in this game include a Cyclops bad-guy, a girl with her pet snake, a magic carpet, a dagger encrusted in jewels, a mystical book and a smiling man. There are the usual 9, 10, J, Q, K and A symbols, making up the lower value positions. 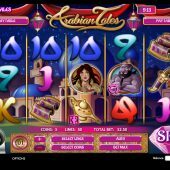 The genie symbol is the key to the free spins in Arabian Tales and landing 3, 4 or 5 will reward you with 12, 25 or 50 free spins respectively. As the feature begins you will be whisked off to a secret cave. Using the famous saying ‘Open Sesame’ your feature will then start. All wins have a 3x multiplier and the feature can be retriggered at anytime with 3 or more scatters appearing.